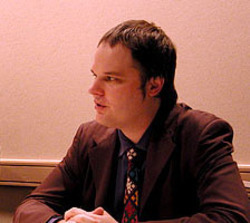 Carl Horn has been a professional anime writer for the last ten years and has been a manga editor for the past seven. A former associate editor at Animerica and manga editor for Pulp magazine, he is also co-author of the book Japan Edge. In 1999, Japan Edge had the honor of being the first book on otaku culture to make Newsweek. Together with Tokyoscope author Patrick Macias, he has presented on anime at the International Film Festival, Rotterdam and the Festival Internacional de Cine Independente, Buenos Aires, and has provided commentary on the field to Wired, Clarín, The Hollywood Reporter, and the Nihon Keizai Shimbun. Recent editorial projects have included the English editions of the Spirited Away and Castle in the Sky anime comic novels.